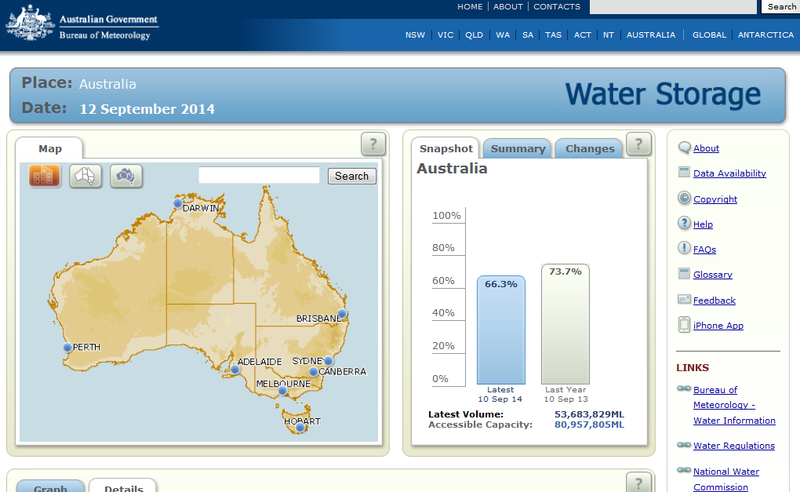 Image above: The BOM Water Sorage interactive. 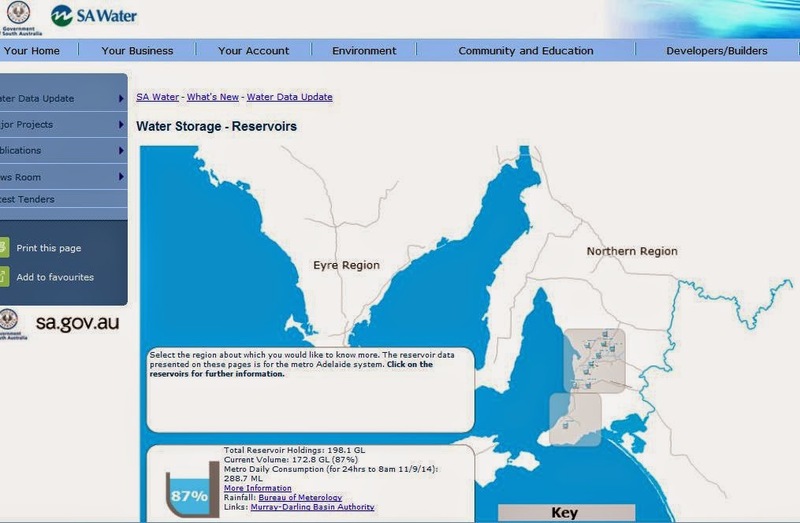 Also have a look at what the SA WATER site tells you about water storage in South Australia. Australian water resources are highly variable, both spatially and temporally. Managing competing water demands against the variable supply becomes more difficult, and the need for precision in management arises, as more of the resource is relied on for extraction and use. In 2004–05, rainfall for Australia was 2,789,400 gigalitres, which was substantially below average for most of the country (except in south-west Western Australia and northern New South Wales). The 2004–05 year was preceded by more than five years of below-average rainfall across large parts of Australia, particularly the eastern states and south-west Western Australia. On average, 90 per cent of rainfall is directly evaporated back to the atmosphere or used by plants—only 10 per cent runs off to rivers and streams or recharges groundwater aquifers. 2004–05 total water runoff was estimated at 242,800 gigalitres and total groundwater recharge estimated at 49,200 gigalitres giving a total inflow to Australia’s water resources of 292,000 gigalitres. Total water resource in 2004-05 was approximately 20 per cent less than that estimated for 1996-97(NLWRA 2001). This decline is likely to be due to drier conditions in 2004-05 and double counting of surface water and groundwater resources in 1996-97. Of the total runoff (242,800 gigalitres), more than 60 per cent occurred in Australia’s three northern drainage divisions. Runoff was greatest in the Gulf of Carpentaria drainage division (62,060 gigalitres), the Timor Sea drainage division (50,240 gigalitres) and the North-East Coast drainage division (40,210 gigalitres). While over 60 per cent of runoff occurred in northern Australia, only 6 per cent of Australia’s runoff was in the Murray-Darling Basin, which accounted for 50 per cent of Australia’s water use occurs. Australia’s total large dam storage capacity was 83,853 gigalitres, with 44,164 gigalitres in storage at 1 July 2004. This is declined by 10 per cent to 39,959 gigalitres at June 2005. The greatest declines in large dam storage levels between 2002 and 2005, in percentage terms, occurred in New South Wales (33 per cent) and Victoria (22 per cent), with an overall decline of 18 per cent occurring across Australia. June 2005 large dams with the highest storage levels were Western Australia (at 83 per cent capacity) and Northern Territory (at 70 per cent capacity). The states with lowest levels were New South Wales (at 33 per cent capacity) and Victoria (at 39 per cent capacity). Also here is the Moodle link to the geographical knowledge and skills Powerpoint we used this week. I suggest you go through the Powerpoint several times to gain an understanding of the key points. Make sure you do those questions on the previous posting about the Murray Darling Basin!